Blossom End-Rot in Tomatoes and How to Conquer It. Blossom end-rot is one of the most deadly diseases for your tomato crops. This disease can attack young, semi-ripe, and even ripe tomatoes that are harvest ready. The most obvious characteristic of this disease on your tomato plant is the appearance of brown specks on the bottom of your tomatoes. If the condition is severe, it can destroy tomatoes’ overall appearance, lower quality and quantity, or even cause total harvest failure. Blossom end-rot disease is actually caused by disturbance in your tomato plants’ physiology that happens because of calcium deficiency. Other than tomatoes, this disease can also happen to pumpkins, peppers, and watermelons. Blossom End-Rot in Tomatoes. Photo by: Ari Setiawan’s Contributor. More often than not, this disease will start to make its appearance on tomatoes that are already half of their maximum size. You will start to see brown specks on the bottom of your tomatoes. If you ignore this, by time those brown specks will be black in color and they will spread throughout all fruit surface that will then cause your tomatoes to rot entirely. If this happens, you should immediately throw out the infected ones so that your crop’s productivity isn’t entirely destroyed. Based on the data from this link: http://kaltim.litbang.pertanian.go.id/ind/index.php?option=com_content&view=article&id=606&Itemid=59 . This disease happens to tomatoes that are planted during the second rainy season, thus when the fruits start to show, it is then dry season. Calcium is needed in a quite high concentration for cell growth. When the fruit is growing and your plant in lacking in calcium, certain tissues will be destroyed and they will leave a mark like the brown specks on the bottom of your tomatoes. Several things can prevent your plants from absorbing enough calcium, which are: excess nitrogen in the soil, root damage, unsuitable soil pH, unstable humidity, high soil sanitation, and too low soil temperature. Balance out your soil’s nutrients. If your tomatoes are showing any of the symptoms, add easily absorbed calcium fertilizer to your soil. Avoid using fertilizer with high nitrogen concentration. Take care of your soil’s humidity. If it’s too dry, water it until the soil is still wet 10 cm under. Using silver mulch over your seedbeds is also proven to be more effective. After you plant your tomatoes, avoid weeding and harrowing too deep into the soil for it might damage the roots. If you make sure to add all the steps to prevent blossom end-rot disease, you can get such productive, disease-free tomato crops with fruitful and profitable harvest. Good luck! 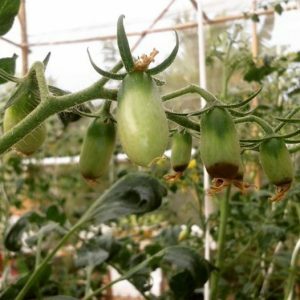 Read more: Penyakit Busuk Buah Pada Tomat (Blossom End-Rot) Serta Cara Mengatasinya. Tags:Blossom End-Rot, Blossom End-Rot in Tomatoes, Blossom End-Rot in Tomatoes and How to Conquer It.